Aurivo announced that the co-operative had decided to shut Achonry, and have the butter packing operation instead carried out by Ornua, a new Bord Bainne plant constructed on the Kerrygold site in Mitchelstown. The winding down of the Achonry plant would threaten the jobs of more than 20 employees, and further undermine a local economy that is already suffering from the closure of government offices and the relocation of the Aurivo headquarters from the south of the county to a business park in Finisklin. An attendance reckoned to be around 100 that turned up for a meeting in Mullinabreena to voice opposition to the move included church figures, public representatives and farm leaders from the region. Jackie Marren and John Gallagher, representing the Sligo Farming Platform, spoke of the importance of the Achonry operation, and the need to have it retained as a crucial plank in the economic well-being of South Sligo. There were impassioned calls for Aurivo, as a co-operative, to reconsider its decision to switch its Achonry operation to the South of Ireland. One contributor warned Aurivo could end up as a PLC. The two- hour meeting concluded with the various attendees agreeing to set up a taskforce to challenge the proposed closure of the Achonry plant as a butter packing facility. The meeting elected Tony Hession, Cloonacool, to head up the new body, and engage with management of Aurivo on the retention of the 120-year- old plant. 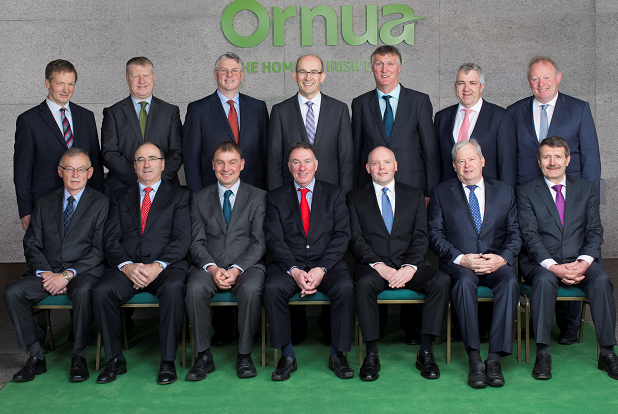 Aurivo Chief Executive Aaron Forde is Chairman of Ornua. Mayo-based ICMSA President John Comer is a member of the Ornua Board of Directors. Top Row L-R: Dermot O’Leary, Conor Ryan, Jim Bergin, Jim Woulfe, Jim Russell, Vice Chairman; James Lynch, Sean O’Leary. Bottom Row L-R: Dan MacSweeney, Michael Hanley, John Comer, Aaron Forde, Chairman; Pat Sheahan, Martin Keane, Ted O’Connor.